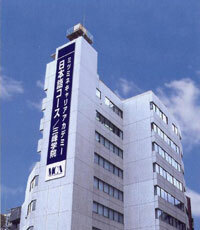 *1 In Japan, most universities or vocational schools begin in April. Students who wish to enter a university/vocational school must be careful about the timing of enrollment to MCA because the time for studying Japanese language is determined by it. It is possible to shorten the applied visa period, but not possible to extend applied period after the enrollment. *2 College student visa to Japanese language schools allows two years at the longest. Students can shorten the period and finish study in Japan. * “Certificate of Eligibility” is issued. “Certificate of Admission” will be sent to the applicant. “Certificate of Admission” to the Embassy. officer at the arrival. 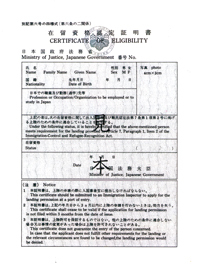 The Immigration Office will receive “Certificate of Eligibility”. The applicant must bring “Certificate of Admission”, “Passport” and “Resident Card” to MCA. The same as the college student visa. “Certificate of Admission” to the applicant. and show them to the Immigration officer at the arrival.